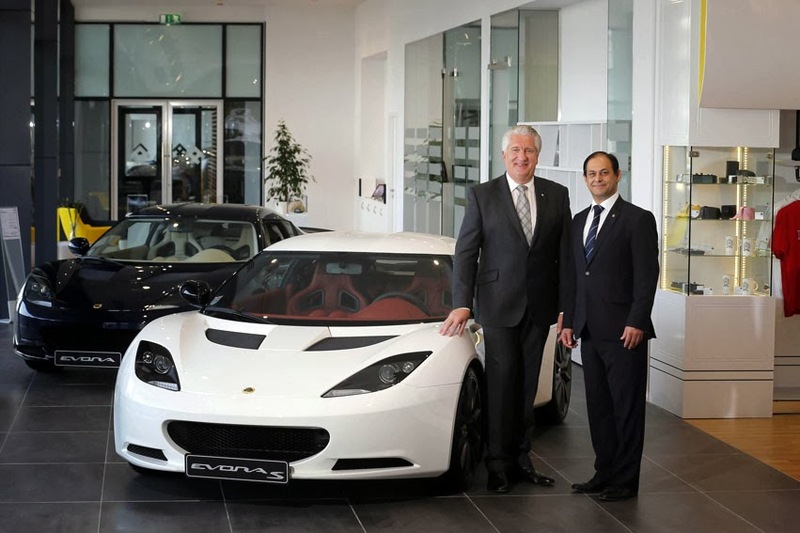 Lotus Cars Middle East (the distributor for Lotus cars in the Middle East) is partnering with Trading Enterprises (part of the Al-Futtaim Group) to open the new showroom in Dubai called Lotus Dubai. the first Lotus showroom in Dubai, and commences an exciting and ambitious plan to strengthen the Lotus brand across the region by developing its operation in both existing and new markets over the next 24 months. Lotus Dubai was officially opened by Aslam Farikullah, Chief Operating Officer for Group Lotus plc, and Len Hunt, President - Automotive, Al-Futtaim Group at a ceremony. Showcasing the stunning Lotus Evora and its supercharged sibling the Evora S, The 425 m2 showroom is a state-of-the-art customer focused facility decorated in Lotus' signature monochrome scheme with bright yellow accents. It is completed with a Lotus Originals boutique and vehicle specification area. Demand for Lotus sports cars in Dubai and throughout the UAE is such that the team at Lotus Dubai anticipate a strong start to trading with the award winning Lotus Evora and Lotus Evora S being joined by the Lotus Exige S in 2014. The Lotus Dubai service centre facility, located close to the Lotus showroom will cater for all aftersales needs, with customers provided with a convenient drop-off/pick-up service directly from the showroom in Dubai Festival City. "The UAE is an important and strategic market with great potential for Lotus. With Lotus Cars Middle East and Trading Enterprises, we will introduce customers in Dubai and the UAE to the world of Lotus, one of high performance, award winning cars with world-class ride and handling, and to our brand which is synonymous with motorsport and Formula 1 - both historically and today," said Aslam Farikullah. Len Hunt added, "Al-Futtaim has built strength and credibility in delivering great customer experience through its well established automotive operations in the UAE. We are confident, excited and proud to exclusively introduce the globally recognised brand of Lotus to this market. Representing Lotus and its products which are also centred on style, passion and performance, offers another dimension to the range of vehicles currently presented in the Al-Futtaim portfolio. We are looking forward to a long and successful partnership." "Partnering with Al-Futtaim is a very positive and important step forward for Lotus Cars Middle East and demonstrates our commitment to building the Lotus brand and product presence in the region. We know that new customers will appreciate Lotus' core values of innovation, exceptional ride & handling, performance through lightweight and, above all, being great fun to drive," said Jonathan Stretton, Lotus Cars Middle East FZ-LLC General Manager.